Manufacturers sell products globally and rely on production and collaboration with partners across multiple geographies. Being a global manufacturer means significant growth opportunity but also introduces layers of complexity such as an increased reliance on the cloud and Internet. 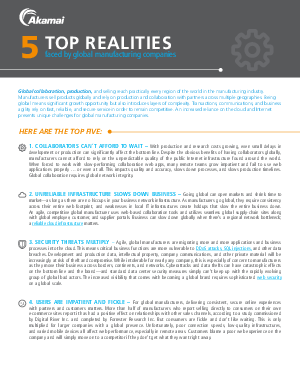 This quick read highlights the top five realities and challenges faced by global manufacturers.